H. Neil Stehle was born on March 30, 1945 to Mr. and Mrs. Herbert H. Stehle in Ann Arbor. Neil is a 1963 graduate of Ann Arbor High School where he was on the gymnastics team. He attended Eastern Michigan University majoring in psychology prior to entering the United States Army on April 29, 1967. Specilist 4 H. Neil Stehle completed his basic training, and radio and communications courses at Fort Knox, Kentucky. He went to Fort Benning, Georgia where he received training at the paratroop school. 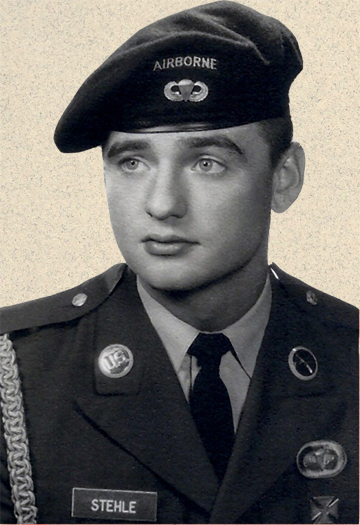 Neil was sent to Vietnam on December 13, 1967 where he was assigned to B Company, First Battalion, 503rd Infantry, of the 101st Airborne Division. On June 3, 1968, Specialist 4 Stehle was serving in Thua Thien Province in South Vietnam when he was wounded by small arms fire. Neil was transported to a hospital in Japan where he died of his wounds on June 11, 1968. He lived 23 years, 2 months and 11 days. H. Neil Stehle is resting in Washtenong Cemetery in Ann Arbor. He is survived by his parents and two sisters including seven nieces and nephews. Neil is listed under Ann Arbor on the Ypsilanti Township Vietnam Memorial and is located on Panel 58W Line 027 on the Vietnam Memorial in Washington, DC. Neil, Its been many years since we were in school. You are missed. Thank you for the sacrifice you made for us. You are remembered and your memory will never die.